This plugins helps you to create Aspose.Slides Maven based project and tryout samples provided by Aspose. 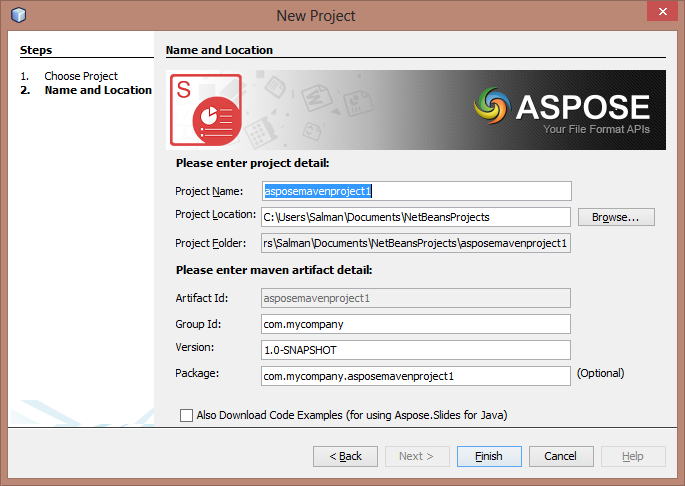 This is new Plugin for NetBeans IDE by Aspose This plugin is intended for developers using Maven platform for Java developments and want to use Aspose.Slides for Java in their projects. 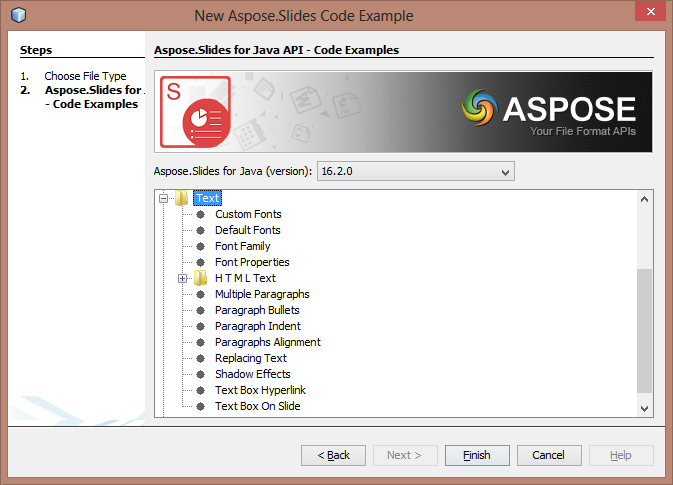 NOTE: Aspose.Slides for Java is Java API developed by Aspose that enables Java applications to read, write and manipulate PowerPoint documents (PPT, PPTX, POS, PPS, POTX, PPSX) PDF, HTML and image file formats without using Microsoft PowerPoint. For the API detailed features list check the link. The wizard will also look for and updates for newly available Code Examples from Aspose.Slides for Java examples repository. What is Aspose.Slides Java API? Aspose.Slides for Java is a unique PowerPoint management component that enables Java applications to read, write and manipulate PowerPoint documents (PPT, PPTX, POS, PPS, POTX, PPSX) PDF, HTML and image file formats without using Microsoft PowerPoint. Aspose.Slides for Java is the first and only Java component that provides functionality to manage PowerPoint documents within your own applications. As with all Aspose Java components, Aspose.Slides for Java is written in pure Java, incredibly priced and lightning fast.